Hilary McCollum is an Irish writer and storyteller. Her award-winning play, Life and Love: Lesbian Style, explores the highs and lows of lesbian existence. It received the Eva Gore-Booth Award for best female performance at the International Dublin Gay Theatre Festival in 2014 and was nominated for the Oscar Wilde Award for best new writing. After two decades in London, Hilary now lives in rural Ireland with her lover and furry family. Golddigger is her first novel. She is currently working on a second historical novel, set within the suffragette movement, with the support of Arts Council of Northern Ireland. 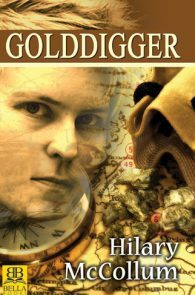 Golddigger, Winner, Historical Fiction, Debut Author, Finalist.